WORK on the traffic bridge over the Murray River on Coolup East Road has been fast-tracked. Transport minister Dean Nalder announced today that work will start in October to replace the bridge. “The State Government is providing $10 million to replace the ageing structure which is owned by the Shire of Murray,” Mr Nalder said. Late last year, the Minister and Murray-Wellington MLA Murray Cowper inspected the bridge and agreed the need to fast-track a replacement structure. “We have brought forward funding from 2016-17 and 2017-18 to enable works to start in October this year and be completed in late 2016,” Mr Nalder said. 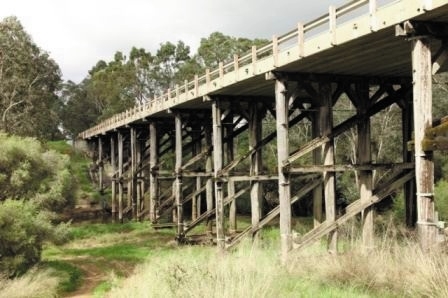 The existing timber and concrete bridge, built in 1964, has a 10-tonne load limit, due to its age and condition. The new bridge will be a two span steel and concrete structure. “The decision to bring forward the construction of the new bridge will be good news for transport operators and all other road users,” he said.